There is a hidden paradise somewhere at the South Coast of Chania… To get to beautiful Loutro, you have to take the boat from Hora Sfakion, or Sfakia as we often say. You can get there by bus or by car from Hania and Rethimno and take the boat or get a taxi boat to the place itself. The weekend that we went to Loutro, we got the one o’colck boat. Loutro is the place I visit when I need to fill up my batteries, to relax and cool down. I love to stay and enjoy life there for some days. First time I ever went to this small paradise, was in 1991. It is easy to take the boat from Hora Sfakion. Hora means town, and the region is called Sfakia, so this the main village in the region. Some gets a bit confused about the names, it is the same place! 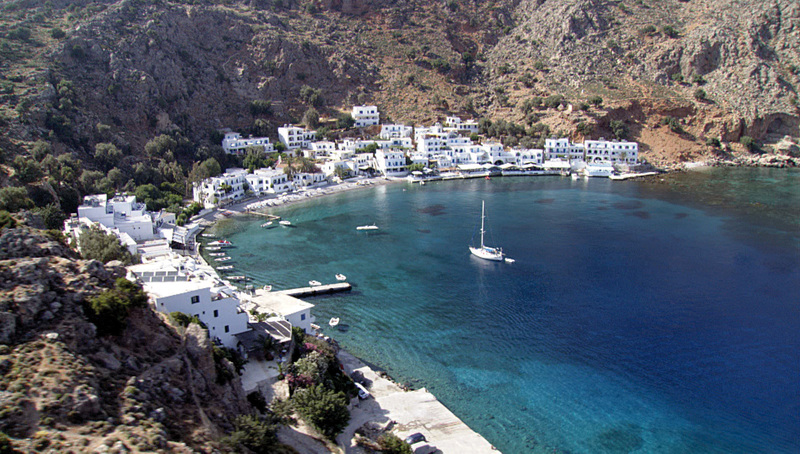 Loutro in my opinion, is best visited in May/June or September/October. 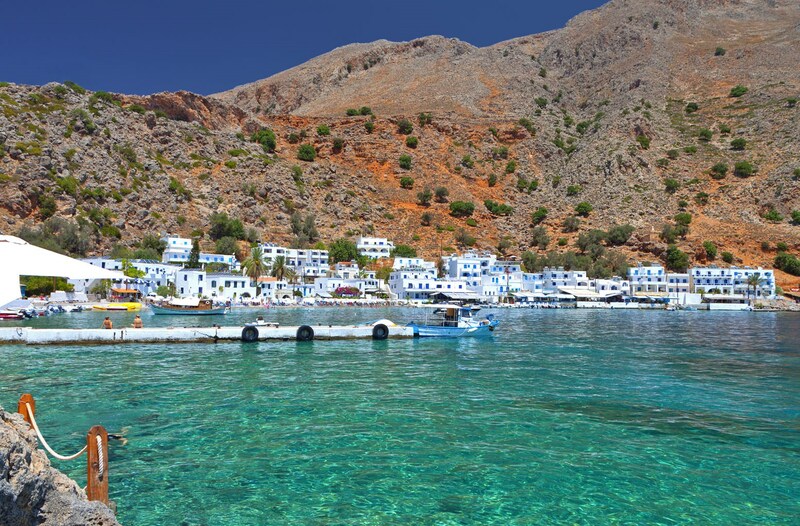 In July and August, it is too hot and croudy, but Loutro is Louto any time of the year. The sea is so crystall clear that never get very warm, because of the cold sweet water that comes up through the sea from the mountain above. The nature and beauty of the place, the quietness without traffic. It is only possible to get to this diamond on foot or by boat, as there is no road leading there. The closest you can get by car, is to Lykos but the road is very bad, and long, and from there you must walk or find a taxi boat. 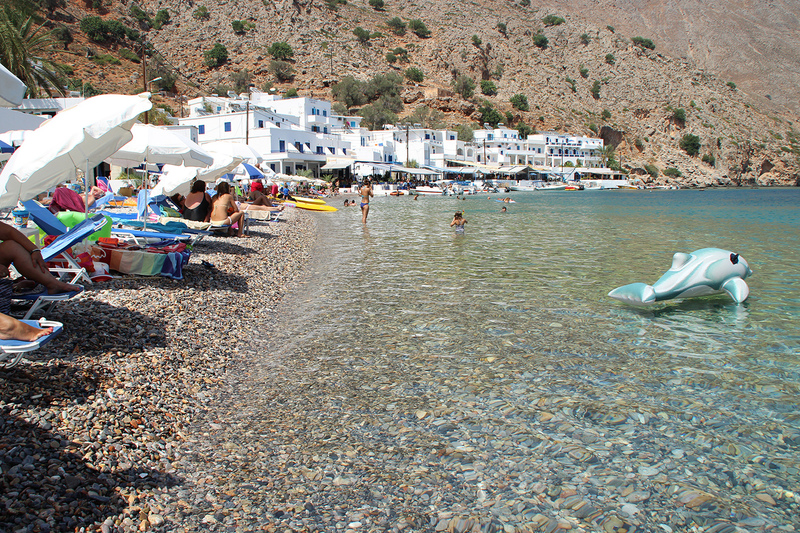 Since Loutro is a very small place , and the sun beds few in the high season, people get up early and grab a sun bed. It is possible to take small boats to either Sweetwater Beach or Marmara Beach. I highly recommend them both. You can also swim at the rocks next to the small harbour there. The place is full of pensions and small hotels, and it is pretty easy to find accomondation. You can also stay at nearby places such as Finix and Lykos. We expiricened full moon in August last year, it was wonderful!! At Louto we swim, read, walk, eat and drink all those perfect dishes they prepare here. They are really good in vegetable dishes. Every afternoon or early evening, I take my walk around Loutro whenever I visit. Many people from all over Europe come here to walk the wonderful E4 walking trail and the gorges around Loutro. Samaria, Aranderna and Imbros are the most famous. On the way home, it is possible to visit Frangokastello, 15 minutes from Sfakia, and we have a swim there.